This is a quick personal note today about sciatica. Yup, those little pains come and go in my life too. I usually see my chiropractor twice a month, but the holiday threw me off schedule so I haven’t seen her since before Christmas. Last night I started having those twinges of sciatica pain. My lower back on my right side, right hip, and right thigh just started hurting. I put some Deep Blue Rub on hoping to head off a full fledged attack. It felt better for a while but that gnawing… it’s enough to make you scream. Then I remembered something. 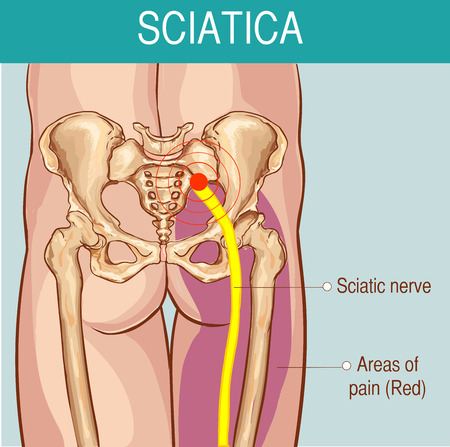 What is sciatica anyway? 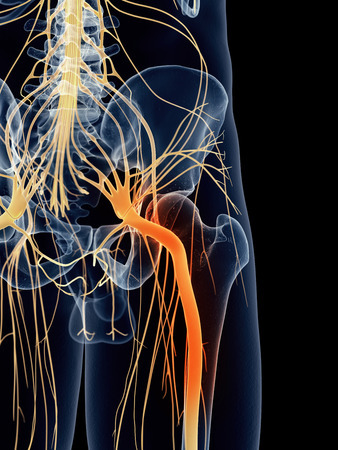 It’s irritation of the sciatic nerve, a really big nerve that travels from the lower spine, and splits into two big nerves as each one then travels down the left and right buttock and legs and ends in the feet. It covers a lot of territory. No wonder it’s a pain. It’s the biggest nerve in the body and can be as thick as a grown man’s thumb in diameter. Causes of sciatica can be a narrowing in the spinal canal, spine injury, disc protrusion, muscle spasms, and even pregnancy can contribute to it. You can see in the photo (lower right) how spinal injuries and structural issues can have a profound effect on function of the sciatic nerve. Some people have a defect in the lower spine that can mimic sciatica and can be serious and needs the attention of a physician. I have done research about sciatica several times. I have found stretching exercises and seriously, sometimes even those are hard to do because of the pain. Today I remembered from my past searches that magnesium may help with relaxing of the irritated nerve. I tried it, and within ten minutes, the pain was totally gone. I used Jigsaw Health Magnesium Powder in water). Do I think that this could help everyone? Not really. Damage to structure needs to be addressed. But for anyone who is stressed out, drinks lots of coffee or alcohol, has digestive issues, or a severe illness (which is considered stress), their magnesium levels can be sub par. Foods high in magnesium are nuts and seeds, leafy greens, avocados, AND… dark chocolate! Blue Vervain: In Our Calming Enzyme.